When you’re preparing to renovate your kitchen, it’s the perfect opportunity to evaluate your needs and figure out the best way to update your space to fit your lifestyle. 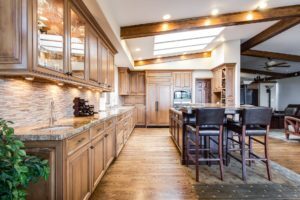 At A-K Custom Interiors, we specialize in kitchen built-ins and love helping our clients get the kitchen of their dreams by educating them on their options. While there are countless ways to customize your cabinets, we’ve listed a few of our favorites below. If you’d like to learn more, schedule a complimentary consultation! Rolling shelves are ideal for squeezing every inch of organization out of your deep cabinets. And, they’re one of the most versatile kitchen built-in features out there. They’re great for storing cleaning supplies under the sink, pots and pans, or pantry items. With rolling shelves, there’s no more digging around for hard-to-reach items. Simply pull out your shelf and grab whatever you need easily. Check out our portfolio to see some of our custom cabinet creations. Does your utensil drawer look more like a junk drawer? Tired of that errant ladle getting in the way whenever you try to close it? With vertical utensil drawers, you have the easy access of upright storage without the cluttered look on your countertops. In addition to installing cups for spatulas and whisks, we can install knife blocks in your kitchen built-ins to keep all your chef’s tools in one convenient place. Are you among the 95% of pet owners who view their pets as members of the family? Then built-in pet bowls might be a perfect addition to your new kitchen. To keep your pet’s food and water dish accessible at all times, their bowls can be installed at the end of a kitchen island or along a row of cabinets. To keep bowls out of sight, we can install a drawer in your cabinet’s toe kick that can be pulled out at meal times and tucked away the rest of the day. Get Started on Your Kitchen Built-Ins Today! Because there are so many options when it comes to kitchen built-ins, it really pays to do your homework. If you want to learn more about your design choices, give us a call at 215-839-6659 or send an email to get in touch. And, don’t forget to follow us on Instagram to keep up with our latest projects!